The following is an extensive review of Avengers: Age of Ultron. Because of this, spoilers are guaranteed, so turn away if you don’t want it ruined for you. But Age of Ultron hasn’t had quite the same success. The movie seemed to have fallen short of financial analysts’ expectations, likely due to the Manny Pacquiao and Floyd Mayweather fight, although it seems that it is catching up for lost time. And the critics were somewhat less forgiving of the movie too, which hovers around the 75% mark. Comparing the latest to the original, Age of Ultron didn’t have some of the advantages the first one did. There was a tremendous amount of hype caused by five prequel films that established and developed the “core four” characters; Thor, Hulk, Iron Man and Captain America. Nick Fury (Samuel L. Jackson) was tacked onto a couple of the movies, and while not totally developed then, Natasha Romanoff/Black Widow (Scarlett Johansson) was introduced in Iron Man 2 while Clint Barton/Hawkeye (Jeremy Renner) got winked at in Thor. Even the villain Loki (Tom Hiddleston) was pre-established. Characters have always been Director Whedon’s strength, and in Age of Ultron the old crew continues to shine. Early, we get a few great jokes and rib poking between the crew. From Tony Stark’s (Robert Downey Jr.) shock of being warned about foul language by Steve Rogers (Chris Evans) to the party jests and friendly vibes, the good times are great and enjoyable for all to watch, however short they last. 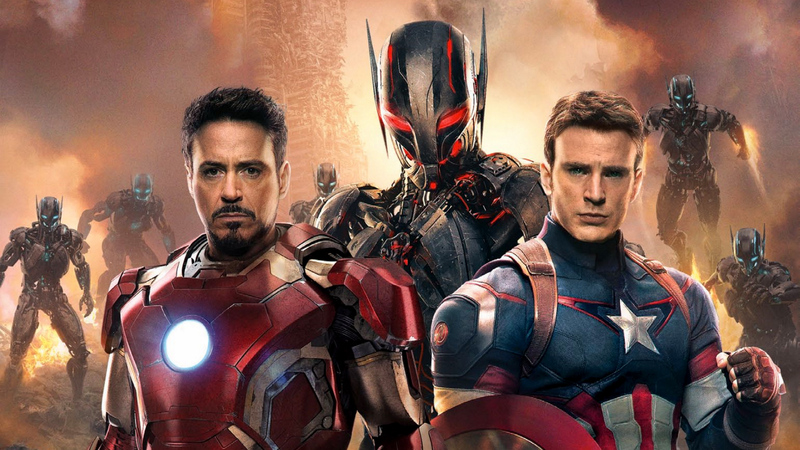 Four new and major characters share screen time in Age of Ultron. The first two were the fraternal twins, Pietro and Wanda Maximoff, better known as Quicksilver and the Scarlet Witch and played by Aaron Taylor-Johnson and the talented Elizabeth Olsen respectively. The siblings held Tony Stark in contempt, after almost losing their lives to the weaponry his company built. The integration of Stark Enterprises in this manner is an excellent reminder about Tony’s past and how, despite his efforts to become a good guy, he still has plenty for which to atone. The twins are so interconnected that they’re effectively one character. While Pietro’s abilities prove to be a handful for the Avengers to deal with on their own during the fight scenes, Wanda’s telepathic abilities force dreams upon the main characters, paving the story telling path for the audience. The results of this range from decent and important, to faulted. On the plus side, Tony Stark’s vision of the Avengers defeat sets the stage for the creation of Ultron, Thor’s (Chris Hemsworth) dream lead the Avengers to knowledge of the Infinity Stones (although the later bath scene was disjointedly added) and whatever Banner (Mark Ruffalo) saw led to an impressive show down between himself and Hulkbuster Iron Man. On the downside, Steve Roger’s continued affection for Peggy Carter didn’t really reveal anything new about him, and the discoveries about Natasha Romanoff seemed to cast a darker element without the payoff of insight that drives the plot. Then there was the troubling Ultron. Created by Stark to be the defender of earth, the protection they needed after the attack on New York in the first movie, Ultron’s construction makes complete sense. But while the origin story is effective and James Spader lends a particular charm to the antagonist, his motivation is weak. During Ultron’s awakening, Jarvis’ attempts to welcome Ultron into existence sends our villain to read up on human history and immediately decides the human race must be removed to fulfill his objective. If the intention for his motivation was a logical assertion that humanity must be destroyed to protect the earth, then Ultron’s well developed understanding of sarcasm is rather inexplicable. On that note, there was one phrase Ultron used to almost mock comic book movie tropes. When the Avengers meet Ultron in Ulysses Klaue’s hideout, Stark asks about Ultron’s intentions. “I’m glad you asked that, because I wanted to take this time to explain my evil plan,” Ultron replies and starts the fight. Two problems dog this line. First, while the villainous monologue is cliche and perhaps lazy, Ultron’s zeal remained under developed on the screen, and the tired trope would have been more effective than nothing. The second problem is correlated, and wouldn’t exist had it not been for a line by Hawkeye towards the end of the film. During a tense moment, Clint tries to connect with the audience with the lines , “The city is flying! We’re fighting an army of robots, and I have a bow and arrow! None of this makes any sense!” But the statement effectively broke the fourth wall, and risked jarring the viewers out of the moment entirely, right at the film’s climax. The two lines build a case that perhaps Joss Whedon’s frustrations with Marvel were finding their way into the script, and risked harming the finished piece. Among those grievances, Whedon also wanted to cast more characters including Spider Man and Captain Marvel. But the ensemble cast was already quite filled out and there was still one more to add; Vision, portrayed by Jarvis’ voice actor Paul Bettany. Created by a union of Jarvis, the Mind Infinity Stone and an android body made of Vibranium, Vision is a truly last minute addition to the Avengers who somehow manages to completely gain their trust with a two minute long talk, the results of which were slapdash and required a considerable suspension of belief to accept. To add anyone else is simply too much. One theme constantly explored in Age of Ultron is love interests. All of the core Avengers got a nod of some kind; Tony and Thor had an gentle ego driven face-off about their girls, Pepper Potts and Jane, at the celebratory party. During a hallucination brought on by the Scarlet Witch’s powers, Steve Rogers recalled Peggy Carter. Best of all, Mr. Whedon invested a healthy dose of screen time establishing Barton/Hawkeye and his budding family. As there are no immediate plans to schedule Hawkeye for his own movie, to see him receive his due here makes one cheer for the little guy. But then there is the big guy and a certain Ms. Widow. 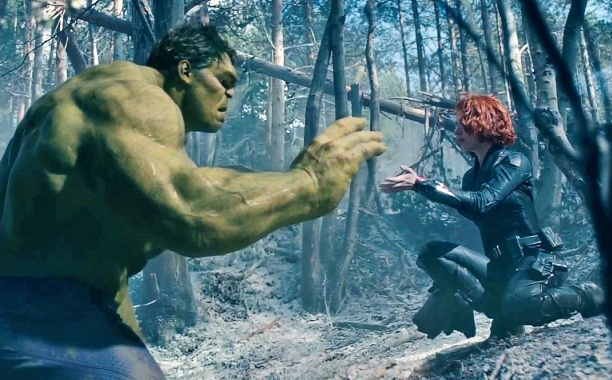 The budding relationship between Romanoff and Banner (Mark Ruffalo) was not a highlight of the movie. It’s not that the relationship itself wouldn’t work; the characters had chemistry and weren’t without possibility. It was interesting to see Romanoff more vulnerable, such that even the bonhomie Captain acknowledged her attraction with a nod to their time together in Captain America: The Winter Soldier. But fans who saw The Incredible Hulk know of Bruce’s involvement with Betty Ross (then played by Liv Tyler). While some defenders of the move may rush to deny correlation between that Hulk movie and the current Avengers, they may forget the final, after credits scene where Tony Stark (Robert Downey Jr) makes a brief appearance to speak with General Ross about the Avengers initiative. Age of Ultron turned its back on that, and Betty went unmentioned. While it’s not hard to imagine Tony returning to his old ways perhaps, or the boisterous Thor acting without thinking, the introverted Dr. Banner is difficult to see as the philandering type. While everyone can relate to Banner’s loneliness, the absence of guilt isn’t becoming of the good doctor. At the very least, some acknowledgement of his former relationship would have helped. At most, some closure to connect the two movies in the greater continuum. But neither was offered, and the issue was compounded by a tongue-in-cheek jest calling the Hulk Buster armor “Veronica,” in reference to the love triangle of Archie Comics. Ignoring Bruce’s previous love life results in incoherent story telling, and feels as though it clashes with the dozen-movie strong universe. After seeing The Avengers, one’s first instinct is often just to watch it again. To relish the fun and charm of these unlikely superheroes bickering and prodding one another until they realize just how high the stakes really are and banding together to save the world. It didn’t need dark and gritty. 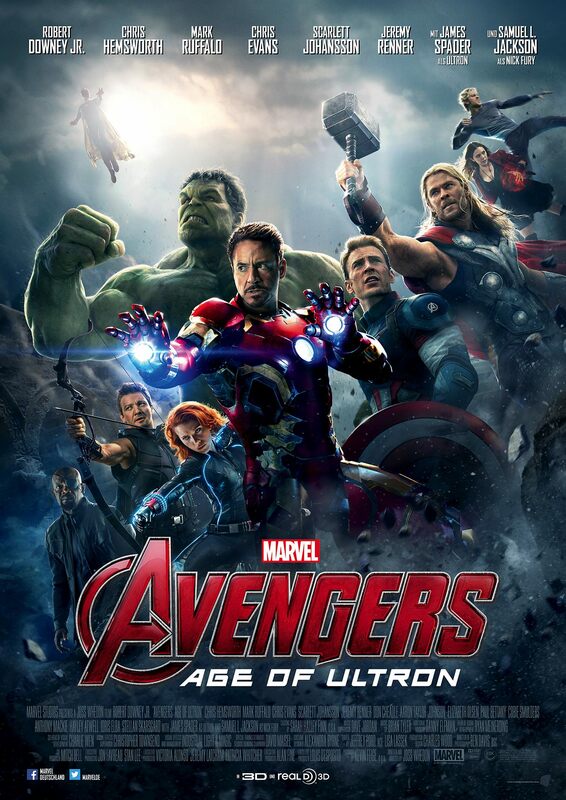 Avengers: Age of Ultron however is something of a mess. It’s enjoyable for turning the brain off for two hours, but the fun doesn’t cling to the audience afterwards. The focus and Easter-eggs seem to rush into preparing the stage for a bigger battle, rather than focusing on the one at hand. Too many new characters are introduced, and trying to divide the time amongst them all equally proved to be a burden. While worth watching, Avengers: Age of Ultron isn’t the cause for celebration we had hoped it would be. At least Daredevil was amazing this year. My first draft for our anthology is complete, but I have to craft a new draft and make several improvements. It will be an ardorous process, but will be more a matter of extending than rewriting. Only one scene (to my knowledge) requires tremendous effort. I also have a few drafts to review. Aside from this, I have two more stories to work on, both for Cruentus Libri. One is for the surgical anthology, while the other is an extensive rewrite for the ‘War is Hell’ anth. In truth, I cannot wait to be free of the Bolthole anthology. Although rewarding and I’m learning a lot, I’m also spending time chasing other writers down, bogged with edits and taking on a horde of other responsibilities that I’ve taken for granted. I have increased respect for the role of editor and publisher. See, what I love and can’t get enough of in games and books and movies are these one-of-a-kind situations. I’m not talking about something as grand as, “Save the world” but wild moments you don’t do again. For example, in the original Metal Gear Solid, there was the torture scene and the rappling game. Gears of War had an interesting segment where you looked for light sources in order to ward off the bat like creatures that ate your flesh. In Dead Space 2 when Isaac launches himself towards the Sprawl and you have to guide him through space. Or in The Legend of Zelda: A Link to the Past where you had to try and figure your way around the other world, despite being changed into a rabbit and cannot defend yourself. When you think about that formula, is it any wonder how the Avengers did so well? You have several fleshed out heroses, each of which had their own movie. And the sheer impact of what was happening forced them to work together. So unorthodox, so out of the ordinary from the usual super hero stuff, it’s no wonder it took third place on the highest grossing movie list. What makes these moments so amazing and huge is the fact that they cannot be easily reproduced. That your character was so desperate that they were forced to do something unexpected and dangerous and you get to control them through it. I don’t want to watch a cut scene where my characters stradles a bomb on its way down! I want to actively guide the bomb! Just like in Dr. Strangelove. I suddenly realize that this was kind of what made games like Final Fantasy XI so popular years after. Events. Events with friends. We stuck together through rough Burning Circle Notorious Monsters and garrison events. We hung together during the invasion of Aht Urghan. There was so much end game stuff, it’s no wonder people clung to the game years after its release. Unforgettable events are where it’s at. That’s the wild ride we should be looking to build in our movies, games and books.